Boat House in Great Cambourne sleeps 5 people. 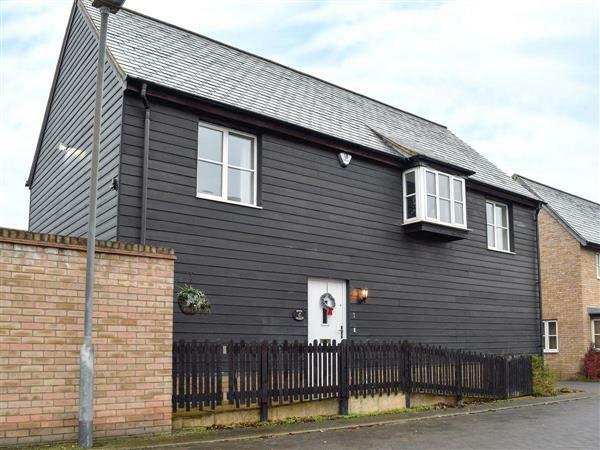 This well furnished, detached mews holiday apartment with its own fully enclosed walled garden is set in a quiet location in the village of Cambourne, which has a good range of shops, tennis courts, a fishing lake and golf nearby. Boat House makes an ideal base to explore the towns, villages and countryside of Cambridgeshire. 6 miles away is the historic university town of Cambridge with its colleges, art galleries and punting on the River Cam. Visit nearby Huntingdon for a day at the races, the Imperial War Museum at Duxford is 11 miles, or the nearby National Trust properties including Wimpole Hall and Anglesea Abbey. Shops, pub and restaurant 500 yards. This well furnished, first floor holiday apartment with its own fully enclosed walled garden is set in a quiet location in the village of Cambourne, which has a good range of shops, tennis courts, a fishing lake and golf nearby. Boat House makes an ideal base to explore the towns, villages and countryside of Cambridgeshire. 9 miles away is the historic university town of Cambridge with its colleges, art galleries and punting on the River Cam. Visit nearby Huntingdon for a day at the races, the Imperial War Museum at Duxford is 11 miles, or the nearby National Trust properties including Wimpole Hall and Anglesea Abbey. All on first floor: Living room with day bed and wooden floor. Kitchen with tiled floor. 1 double bedroom with additional single (for child). Bathroom with shower over bath and toilet. Gas central heating, gas, electric, bed linen and towels included. DVD. CD. Gas hob. Electric oven. Microwave. Washing machine. Enclosed, lawned garden with sitting-out area and furniture. Parking (2 cars). No smoking. Holidays at Boat House run from Saturday to Saturday. For a better idea of where Boat House is, you can see Boat House on the map below. Boat House is in Cambridgeshire; should you be on the lookout for a special offer, you can find all the special offers in Cambridgeshire. It's always worth checking to see what is on offer at the moment. Do you want to holiday near Boat House (W42587), you can see other cottages within 25 miles of Boat House; have a look to find your perfect holiday location.